The APP allows to control and program THERMO ICE WiFi from iOS mobile devices. With THERMO ICE APP you can manage, in a easy way, your heating/cooling system from your mobile device: you need a Gewiss THERMO ICE WiFi thermostat on your plant. You can see the current room measured temperature and temperature set point, the HVAC mode (comfort, pre-comfort, economy, off) and a feedback if your heating/cooling system is working or not. You can modify the current and programmed setpoint or the HVAC mode wherever you are. 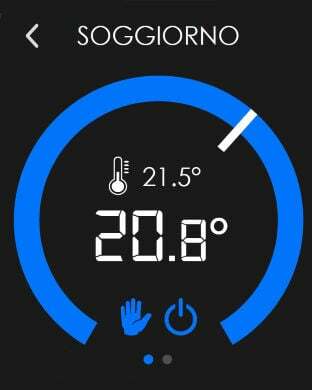 With the APP you can program daily scheduled temperature profile in order to plan the desired temperature at every time of the day or activate the self learning function that, after learning your habits, generates a program in an automatic way. The connection to the THERMO ICE WiFi is made easy and implemented through a cloud server. Cloud services are free and do not require a subscription fee. Every user can control one or more thermostats that are associated to his account. A DEMO mode is available to test the APP also if you haven’t still purchased a THERMO ICE WiFi.